A well rested dog is a happier and healthier dog -and our latex foam dog beds set a new standard for canine comfort! Latex is naturally resistant to microbes, mites, mildew, and molds. It's two to three times denser than polyurethane foams - which means less sagging and more durability - and which is why our beds are guaranteed to never sag, flatten out, break down or get lumpy for the life of your pet! Best of all, latex instantly conforms to your dogs body, cradling him or her in plush, pillow-soft comfort. 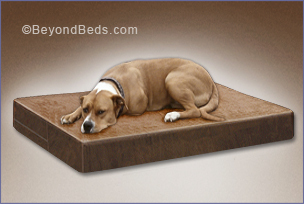 Why a Natural Latex Dog Bed? 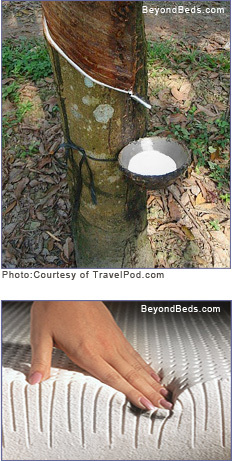 Latex is made from all-natural rubber from the rubber tree. Latex foam is significantly heavier and denser than synthetic foams, thus providing an enhanced level of comfort and support. With latex, there are simply no pressure points (as there are with regular foam, egg crate foam, and polyfill dog beds) to impinge on your pet's comfort. And although latex is completely biodegradable, it will last for up to 30 years before it starts to wear out - well beyond any dog's lifespan. Another comfort plus: latex foam does not overheat like other foams, so its superior breathability" helps keep dogs cooler in the summer and warmer in the winter. Medium 26" X 40" X 4"
Large 30" X 48" X 4"
Extra Large 36" X 52" X 6"
Washable Microfiber Suede Cover: Remove cover. Machine wash in cold water on delicate cycle. Lay flat to dry. These new high tech microfiber faux suedes are elegant, durable and water repellent. Note: These dog beds are custom made upon receiving your order. Please allow 7-10 business days for delivery. Note: It is very important to measure your pet lying down from nose to rump before ordering your Natural Latex dog bed. If the measurements of your pet exceed the measurements of the bed you are considering, choose the larger size. Warranty: Lifetime Made in the USA.